An incredible, Commemorative Chute knife made from Steel from the World trade Center. It is a full integral knife. 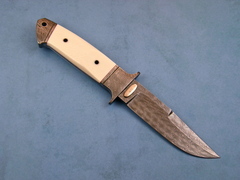 This is 1 of 7 knives like this that were made, along with a Prototype. 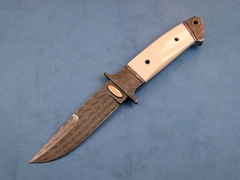 The Damascus was made by Master Smith Connie Person using the steel that came from the World Trade Center. The two bronze escutcheons were made from the ball at the World Trade Center Plaza. One is marked "WTC", the other "9-11-01". They are found at the ricasso on either side of the knife. The handle material is made of Antique Ivory. A truly magnificent knife.